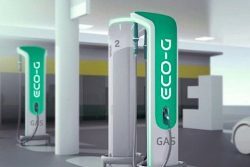 ECO-GATE (European COrridors for natural GAs Transport Efficiency), a European Consortium co-financed by the European Union and led by NEDGIA (Naturgy group’s gas distributor), has introduced the ECO-G brand, designed as the unique name to rename natural gas for vehicles. In a scenario where petroleum fuels are still a majority, the new brand revolves around the idea of ​​”smart ecology” — natural gas is the most environmentally friendly, economical and present alternative to promote sustainable mobility on land and sea. With ECO-G, ECO-GATE aims to unify the different ways in which it refers to all forms of mobile technology that uses gas as a fuel. The brand will function as a seal of designation; it can be used by manufacturers of terrestrial or maritime vehicles, vehicle users and technology companies, marketers and distributors in the natural gas for transportation sector. ECO-G is a clean technology that reduces to almost zero the pollutant emissions that affect air quality in cities: up to 100% the emissions of NO2 and more than 95% of solid particles. In addition, it reduces sound emission by 50% and the vibrations, compared to diesel engines. Utilising renewable gas natural gas (RNG), CO2 emissions are neutral: 100% reduction. Of all alternative fuels, ECO-G is the only one with developed and operational solutions for all mobility needs, from passenger cars to urban displacement to long distance transportation (international), without loss of benefits and autonomy. In addition to environmental benefits, sustainable mobility with natural gas carries significant fuel savings: 50% compared to petrol and 25% for diesel. For example, a light vehicle with EUR 20 (USD 22.50) can travel 275 kms with petrol, 375 with diesel and 555 with ECO-G. The use of natural gas as a transportation fuel has been in use globally for decades, especially in Latin America and Europe, as in Italy, with more than 1 million vehicles and more than 1,100 stations, or Germany, with about 100,000 vehicles and almost 1,000 stations. In Spain, the market continues to demonstrate considerable upward movement: in 2018, 5,745 new natural gas vehicles were registered (146% compared to 2017) and the national fleet exceeded the 14,200 units (a 68% more than the previous year). The ECO-GATE European Consortium is one of the most ambitious global plans for mobility with conventional and renewable natural gas. Co-funded by the EU’s Connecting Europe Facility (CEF), it is managed and coordinated by NEDGIA and is made up of natural gas operators, providers of technologies and services, end users and experts in knowledge of the market and its promotion in Spain, Portugal, France and Germany. ECO-GATE uses new technologies and applies innovative solutions to enable the rapid and massive deployment of this alternative fuel, thanks to a significant reduction in unit cost and a better understanding and greater knowledge of the needs of customers. The project envisages the construction of 21 natural gas refueling stations along the Atlantic and Mediterranean corridors in each of the 4 countries participating in the project: Germany (1), France (1), Portugal (6) and Spain (13). To this end, the funding provided to ECO-GATE will be shared between the four countries and will allow the development of gas stations in Barcelona, ​​Córdoba, Cartagena, Irún, La Jonquera, Madrid, Salamanca, Tordesillas, Aveiro, Lisbon, Setúbal, Tours and Heddesheim, among other cities. In addition, it also contemplates the completion of two pilot projects for the supply of renewable gas and hydrogen. ECO-GATE also has the support and interest of the Ministry of Industry of Spain, the Direção Geral de Energía e Geologia de Portugal and the Spanish Gas Association (SEDIGAS).